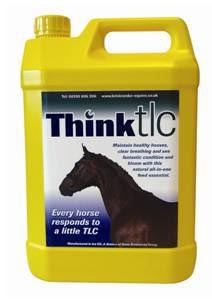 Brinicombe Equine Think TLC is a unique liquid supplement which provides support for the horse in 4 key areas. This one supplement targets condition, breathing, digestion and hooves, and is designed to complement the compound feed without risk of over supplementation. It is low in sugar and extremely palatable so will be taken easily by horses. There are currently no questions for Brinicombe Equine Think TLC for Horses - be the first to ask one!